Our Internet service has been restored (hooray!) and I managed to get another listing up in my Etsy shop. 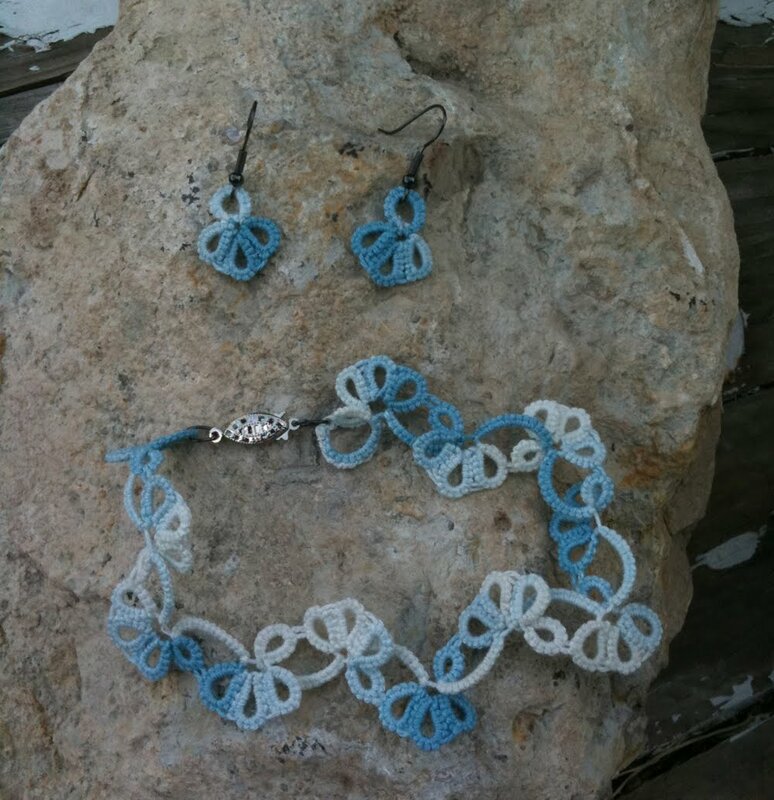 It's a bracelet and earrings set, tatted in variegated white to light blue thread. Since the last bracelet I made fit the average person but not my chubby wrists, I decided I would make this one longer. The curvy design in the pattern didn't lend itself well to measuring and I got carried away. It ended up being nine inches long (plus the clasp). I was a little worried, but it actually looks good as kind of a loose and lacy bracelet. It hangs nicely and feels pretty. Now I need to get a grip on measurements for average size people. I'm so excited I got another tatted item finished and listed. 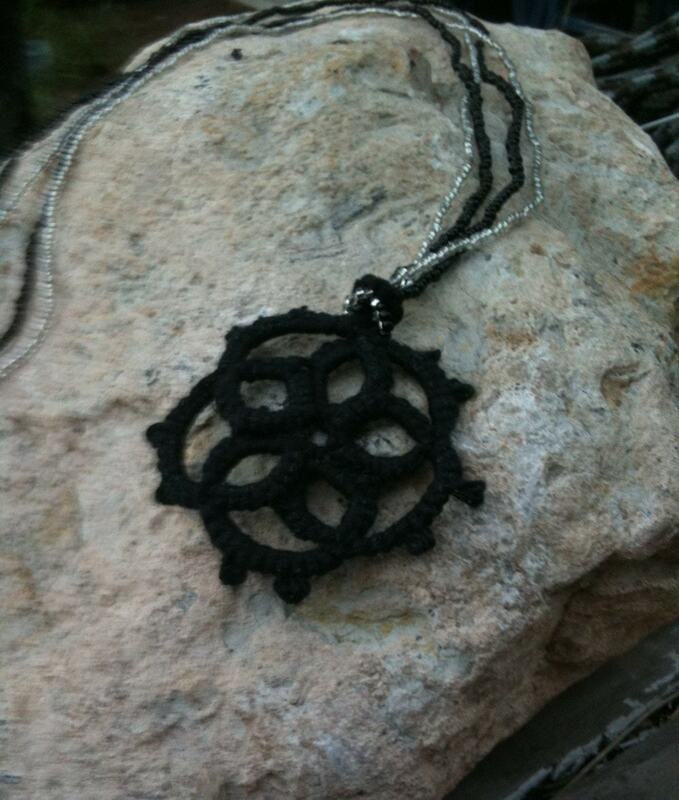 The tatted rosette was done a week ago, but it took awhile to find the right necklace for it. Originally, I planned to use a jump ring to attach it to a rubber cord necklace. Somehow, that just didn't seem quite right. The thread I used for this piece is black with silver flecks and I really wanted to highlight that tiny bit of sparkle. The black and silver seed bead strands look great with it and allowed me to fasten the tatting to them without using any metal pieces. The result is everything I hoped for! I have it listed now on Etsy and I'm hoping to sell it soon. The Internet problems are still hampering us, but I did have some great news today. 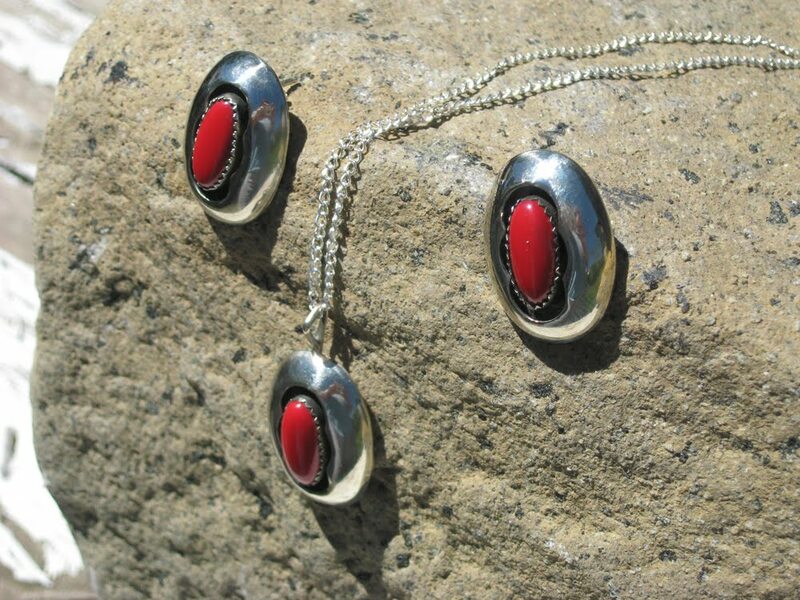 One of my necklace and earring sets sold. This is the first item to sell from my shop that wasn't a graphic design order. Yippee!! My favorite customer, elladean, ordered another graphic needing revision and I won an Alchemy bid to create an alphabet with a double outline. It sure is nice having things move along like this. Things even went well on a personal level. We had some great visitors from our neighborhood and enjoyed discussing what all our kids are up to and how we can help each other out. I happen to live in probably the best neighborhood anywhere for being social. 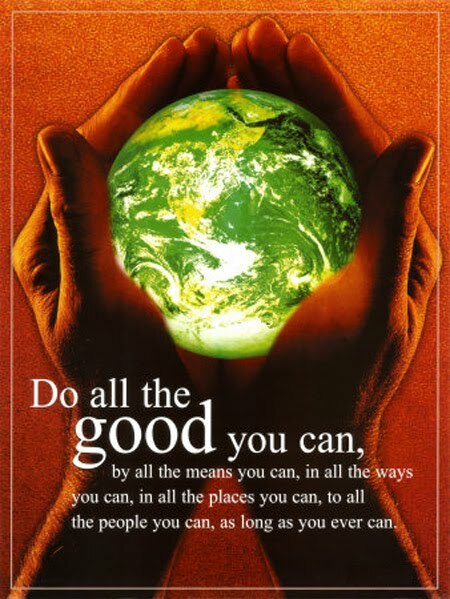 This is one of those little areas where everyone watches out for each other and cares how people are doing. They also welcome everyone in. Having a great home life sure makes things easier! All the excitement of doing business online sure goes away fast when you can't connect to the Internet. Friday morning, I got a call from my husband letting me know that the router for our home computer had died. "Simple fix," I thought. Boy, was I wrong....very wrong! I told him to take our oldest son with him to buy a new router and get it set up. They actually ended up coming home with two different routers after hitting a couple of stores. After a few hours of trying to set it up, they were at their wit's end when I came home from work. I have to admit I was overly confident that I could get it going in no time and figured they had missed some step in the process. Nope....not gonna happen! We battled our Internet service provider who was sure it was a problem with the router and the router company who was sure it was an Internet connection problem. We even went to the store and bought yet another router and made sure it was a completely different brand. Still no luck. I reset, rebooted, power cycled, pinged, updated, released, renewed, switched cables, unplugged, replugged....you name it. From what I can determine, there is Internet service coming into our house and it will work (for a few minutes at a time) when plugged directly into a computer. the connection from the computer to the router and from the router to the Internet is there, even though the router can't see it. My theory is that the Internet signal is too weak and/or sporadic for the router to truly see it and get set up. I have heard from neighbors that they are experiencing difficulties with the same Internet provider. Why am I telling you all this? I missed out on at least one Alchemy job I bid on because I couldn't get online to answer the potential buyer's questions. Since I couldn't get on Etsy to try to bid for more work, I missed out on any jobs that went to those quick bidders. I had never considered what to do if I couldn't get online. I've been so devoted to pursuing online work. I'm not even sure that I'll be able to post this when I get done writing. Modern times - modern troubles! Personal business kept me away from Etsy tonight. I'm trying to simplify my life and my expenses. People think it's weird that I carry two cell phones. Our family originally had one cell phone to share. Later, my boss decided that it would be good for me to have a cell phone for work so I could be reached, especially when we're planning events and doing our annual play. That worked really well since it was an AT&T phone and our family phone plus my sister's phone were also on AT&T. Unfortunately, the powers that be decided to switch to Sprint. I'm not even going to start telling you how much I dislike Sprint.... Anyway, using the Sprint phone to call my husband (who had now claimed the AT&T phone as his own) started getting expensive. We decided to do one of those family plans and changed our home telephone number over to a cell phone, added a phone for me, and added a phone for our sons to use for field trips and other times they would need to let us know where they were. So....2 phones! Yes, I carry them both at all times. Yes, it is bothersome. Yes, people get confused about which number to call me at. In fact, I'll send a text from my Sprint phone (it has a keyboard) to my friend Tami and she will text me back on my AT&T phone. Don't ask me how that happens! I got permission at work to ditch their phone and just use mine. I've gotten spoiled on getting email on my work phone, so I started looking for an AT&T smartphone. I didn't expect the iPhone to be the best deal out there, but it was, so my husband decided to get the new iPhone 4 and then I would take his iPhone 3G. We made a reservation online for the phone, but because it didn't show up on their computer, they kicked us over to the "walk-in" line. It took 5 hours and 45 minutes to get into the store (on the hottest day of the year so far, no less) and then another hour for the phone to actually activate. Even though there was no time for Etsy activities, it was actually kind of fun hanging out there with all the chaos. The Apple Store workers at the front of the line would cheer as they sent people into the store and cheer even louder as people came out with their new phones. It was amazing to see all that energy after they had been working 15 hours and still had a couple more hours left. I did manage to be productive while in line and finished the ends of some of the bracelets I tatted and started tatting a new bracelet. Let's hope I can get these bracelets listed soon so we can pay for this adventure. The good fortune is continuing and I'm feeling pretty good about my Etsy experience right now. Some really great people are out there and I'm thrilled to have met them. One shop owner has given me several projects - one of them is pictured here. Elladean makes all kinds of vegan bath and body products and has really cute designs for her labels. She had some quick changes she needed to make and I was happy to help her out. Also, my dear friend returned from her vacation with some beautiful beads made of turquoise so I could make something great for my shop. I'm still new to adding beads to tatting, but I can't wait to try these. Despite some of my negative experiences on Etsy, I try hard not to let it poison me. I still try to take some risks here and there and hope for the best. 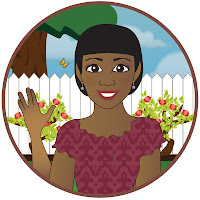 The experience of being in a BNR treasury didn't lead to any sales for me, but it lead me to create one of my own where I featured the shops of people who had been kind to me and helped me on Etsy. It already led to a sale for someone who had helped me. Several design jobs I've done were for no money, but the buyer was willing to send items from their shop. Since we're rounding up items for the auction at Heritage's Gala in October, these items will come in handy. The competitiveness in Alchemy can really get to you as you realize that there are people who take advantage of the system and go after the low bidders. There are also bidders for the design work who quickly whip up what the buyer wants and send it to them, leaving the rest of us out of the running. I managed to find a way to handle this. On some listings, I don't even bid when I see that there have been a bunch of bids already. Today, I took a chance and did the photo editing job right away and sent a proof to the person who had listed on Alchemy. The buyer contacted me and told me someone already sent her one (dang!). The good news came when the buyer liked my work and gave me another job to do (yee-haw!). So I plan on continuing to send positive vibes out into the universe and expect positive to come back to me. If nothing else, I'll feel better about it. We went to a powwow last night at Soldier Hollow. It was wonderful to see our friends and hear the beautiful music. 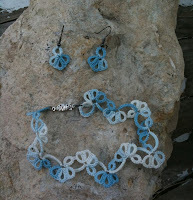 I took along my tatting and managed to finish a bracelet and some earrings while we were there. Sometimes I forget how interesting tatting can be. Several young people gathered around to watch me tie those little knots to create lace. I think it may be the first time I have combined this European skill with our family's Native American heritage. 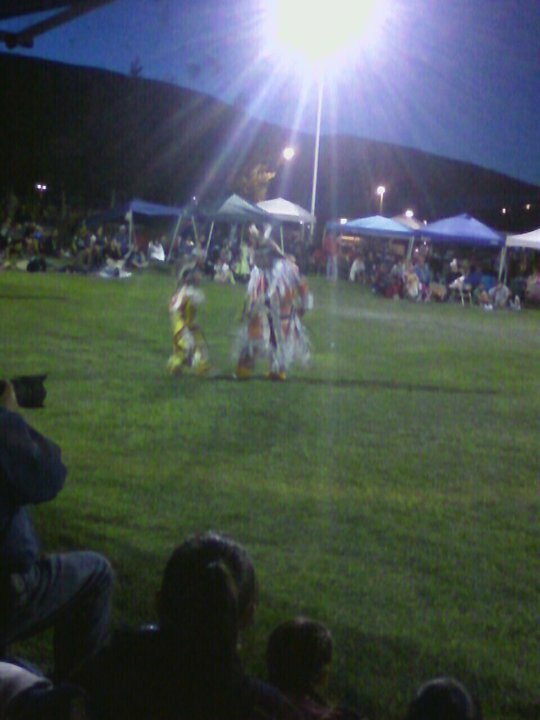 It was a great night overall and we're hoping to return to the powwow today. My latest job was a heck of a lot of fun. It's the one I mentioned before where I needed to find out what "funky modern" is. The Paper Mill does a lot of different things with paper. She wanted to do something that played on the name of her shop, so I proposed doing a windmill with the blades made of the kind of paper she uses for her designs. She liked the idea and I'm pretty happy with the results. 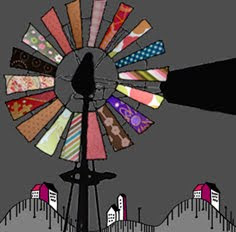 Each of those paper "blades" on the windmill is from a photo of an item she made for her shop. Originally, I had an old 4-blade windmill, but she liked the kind we ended up with since she saw a lot of them around the area where she grew up. Getting this banner (and other graphics) put together was a bright spot in my day. Her happy reaction to the results was awesome! Projects like this make up for some of the crappy times I've had. Styles and Themes and Fonts, Oh My! Plunging into some of these design jobs has made me realize how out of touch I am with some of the popular design styles. I am so used to a more conservative type of design for what I do at work and I usually let other designs like invitations and posters be inspired by the event or the personalities involved. When someone gives me some good examples to work with, I can pull it off fairly easily. Unfortunately, not all people can describe what they want....even if they know that the design you just showed them is NOT what they want. I've had a few design jobs lately where I had to take a couple of stabs at it before getting it right. Sometimes, I don't mentally link the style and the term it's called by. Today's new term = "funky modern." Don't even ask me how to describe it. It's an "I'll know it when I see it" sort of thing. The good thing is that I am continually exposed to new styles as I do more design work. I've also been more selective about the projects I bid on since there are some descriptions I can't wrap my head around. Somebody listed a request today for a flyer that would incorporate tattoo art. It's definitely not my thing! I'm finishing up my "funky modern" project tonight and I have a couple of other people seriously considering me for projects. I got burned by someone on Etsy today. They had posted an Alchemy request for a banner and had given some details of what they were looking for. I put in a bid and knew I could get the basics of the design put together quickly, so I sent a mock-up or preview to them. The buyer responded with what she liked and what needed to be changed. I changed it up and she liked the font and gave some other suggestions. After the next set of revisions, I didn't hear back from her. Assuming she was done for the night, I just waited until the next day to check back. A couple more days went by and still nothing. I keep an eye on my past bids - partly out of curiosity and partly because I worry that someone will use the mock-up I sent without paying me anything. While browsing the list, I noticed that the buyer I hadn't heard from had changed her avatar. It looked similar to the type of thing she was hoping to have as a banner. I clicked on the bid information and saw that she had accepted a bid, but it wasn't mine. Looking for answers, I sent a quick convo (message) to her asking if she had decided to go with another designer. Soon I had a convo in my box from the Alchemy Convobot telling me my bid had been declined. How rude! Why do people think it's okay to lead you on like that? She still doesn't have a banner up for her shop. All she had to do is turn me down in the first place or tell me that what I had didn't match what she wanted. Rather than trash my hard work, I decided to change the shop name on the banner and keep it as an example of my work. The funny thing is that when I bid on another banner project later, I described my ideas for it in writing and mentioned my reluctance to provide a mock-up because of being taken advantage of....I won the bid! I didn't manage to sell anything while included in that BNR listing, but they nicely included me in their new BNR with the same $5 and under theme. Let's hope this one does better. There were 15 sales attributed to that last BNR. This post goes beyond my Etsy experiences as all my sales there have been digital items that I could email. I've played around with selling on Ebay over the years and I sometimes have to ship things at work. Since it doesn't happen often, I'm not as up to date on shipping practices as I guess I should be. One snag I've run into is the extra paperwork and trip to the post office if you want to ship something to our neighbors in Canada. My personal experience with trying to send an item to Canada and with no tracking possibilities led to a nasty dispute on PayPal which left me minus the item and the money. The positive result of this was that when I had to mail some things this week at work, I already knew a little about how to handle foreign country shipments. The other snag has been the change from tracking packages being a nice extra to having the tracking be required. If you don't have a way to prove that you shipped the item and it arrived, the buyer can file a complaint and could receive the item. I just got hit with one of those and I believe the buyer is just exploiting the system. Lesson learned!! I will no longer ship without tracking information. Unfortunately, that means shipping costs will go up. I'm not a fan of those who charge a bunch extra for shipping and handling, so I always try to keep mine reasonable. Sometimes I end up eating some of the cost. If I ever get things moving out of my shop faster, I will need to consider having a better system for determining shipping costs and getting things packaged quickly. It would be nice to at least have an accurate scale so I can do this stuff online. PayPal offers a nice shipping service for sales paid there. I found a wonderful new abbreviation on Etsy....BNR. What is a BNR? It's a Buy and Replace treasury or listing. The curator of the treasury puts together their original collection. Some will feature friends, team members forum members, etc. and some try to stick with a theme for the collection. The rules of the particular BNR are posted. Most commonly, if you buy an item in that treasury, you then post a comment stating what you bought and the transaction number. Then, the curator of the treasury replaces the sold item with an item from your shop. You get exposure there until your item is purchased. The hope is that others will look at your item and your shop and that someone will buy your item so they can get into the treasury too. After stumbling across a BNR for $5 and under today, I decided to buy my way in. Now one of my items is featured and people are looking at my shop. I'll let you know later if it led to anything. The creator of this BNR says she will delete it and start over in 2 days. Today's Etsy lesson is that being part of Etsy can be just as time consuming as playing games on Facebook. 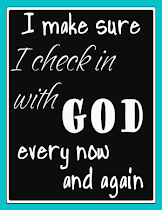 It doesn't have to be, but it's that way for me right now. Part of it is due to that part of my personality that doesn't allow me to pass my mailbox without checking to see if there's mail. I can't help it...even after the once per day mail delivery has already happened. The 24/7 nature of being online just makes it worse. 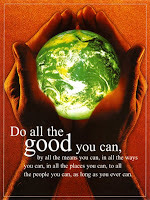 So I keep checking Facebook, Etsy, my blog, and my email to see what's new...please, please let there be something new! Another reason for the time drain is because of those beautiful treasuries I curated. When people buy the items in there, they have to be replaced with a new item. The one I can't ignore is one that features items with arrows. I lined them up perfectly to lead the eye around the collection. One missing item slides everything and messes the whole thing up. Reason number three is not wanting to miss opportunities on Alchemy. This may not be very legitimate since I haven't figured out if timing plays a role in people accepting bids. The last reason is "research." Browsing the site and seeing how other people write up listings, take photos, and arrange their shops helps me improve my shop. Since part of what I offer is design work, I like to see what's "hot" so I can premake some items to list. I can see that I will soon need to develop a time management strategy if I want to keep my sanity. I did eventually do a few banner jobs really cheap just to get the ball rolling. The buyers were very happy with the results and it didn't take too long to put together. Since it only involved time I was spending watching TV, I figured it wasn't really a loss. The graphic design community on Etsy hates what this process is doing to prices and expectations, but these sales are generally made to those who wouldn't pay for real design anyway. I don't mind too much since I'm pretty much a dabbler or hobbyist and I can deal with the Walmart crowd. People who would pay $50 an hour for graphic design are going to want someone with much more experience. Once I get more established, I'd like to get at least $10-15 per shop banner. One of the things I find really fun to do on Etsy is create treasuries. What are treasuries? 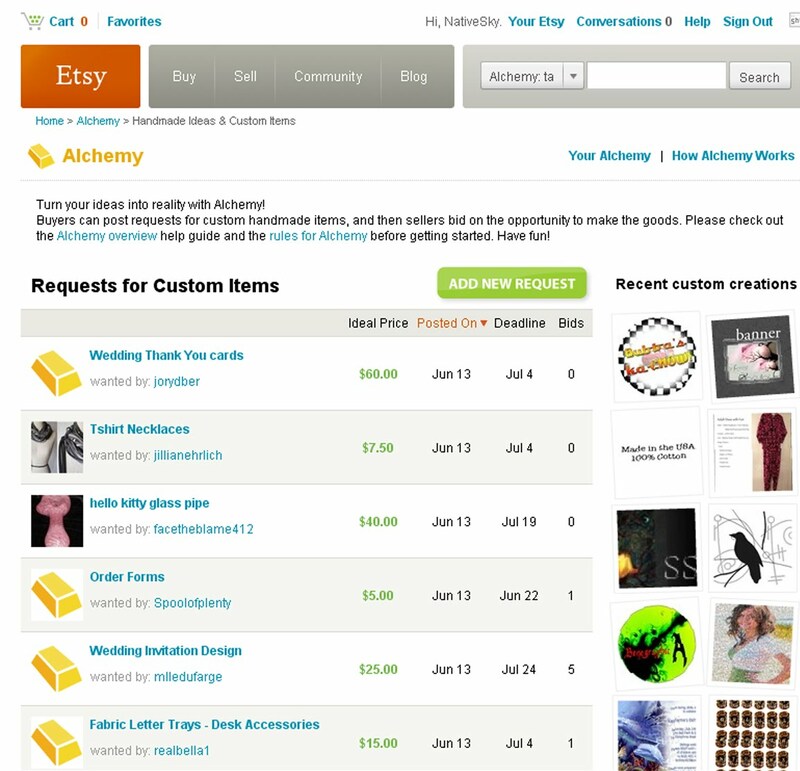 Etsy lets individuals make collections of up to 16 different items. They are displayed in a nice little grid of thumbnail pictures and you add a title and an optional description. The treasury could just be a wish list of things you like or items based on a theme. I have treasuries based on the beach, Utah sellers, feathers, beagles, diet coke, old video games, fake food, nuts, and more. Why make them? 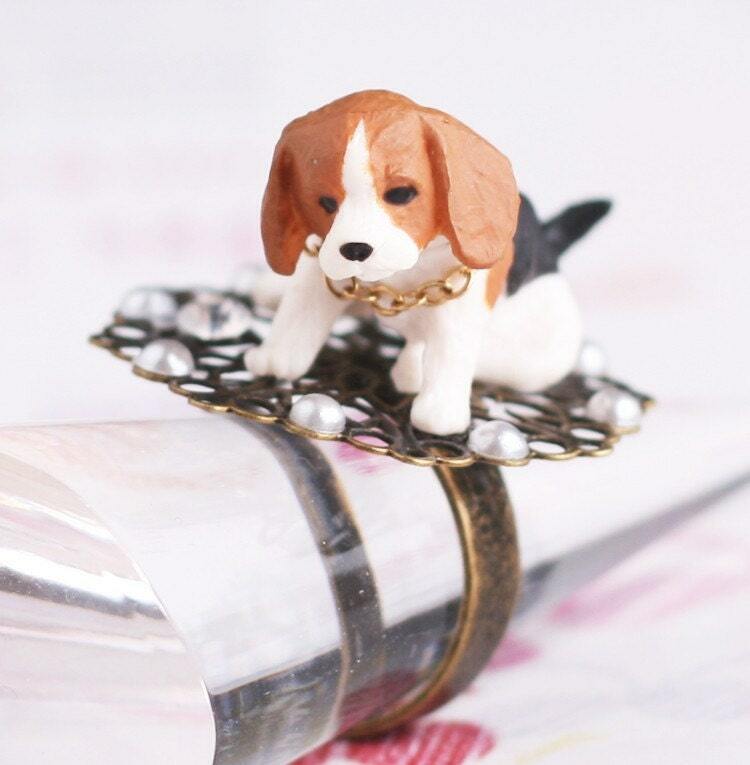 Other people on Etsy can see the collections and make comments on them. It can lead to people looking at your shop. 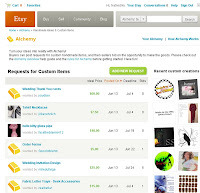 Etsy also regularly selects treasuries to feature on the front page. 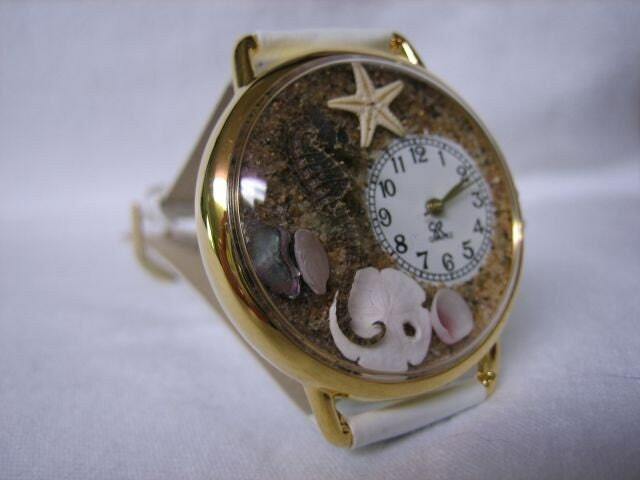 It has led to people checking out my page more, but not to any sales. Still, it's fun to look around at everyone else's stuff. My husband and I have always done crafts off and on over the years. At my workplace, we have a craft boutique every November and that gave us an outlet for sales. We have made and sold buckskin dolls, tatted snowflakes, Navajo jewelry, etched candle holders, dreamcatchers, Native American themed picture frames, fabric and rice dolls, Navajo fry bread mix, hair decorations, and more. I've sold things on Ebay over the years, but I never liked gambling that someone interested in your item would try to buy it in the 7 days it was listed. A coworker introduced me to Etsy and I was hooked. I admit that it's been harder than I imagined. My first product pictures were awful! I had taken them with the items just laying on a sheet. After spending more time looking around at other shops, I realized how boring my stuff looked and I took new pictures. It seems to have increased the number of people looking at individual items in my shop.